Middle Georgia State University and Macon-Bibb County will jointly observe Veterans Day and the 100th Anniversary of the end of World War I by holding two ceremonies on Sunday, November 11 and Monday, November 12. 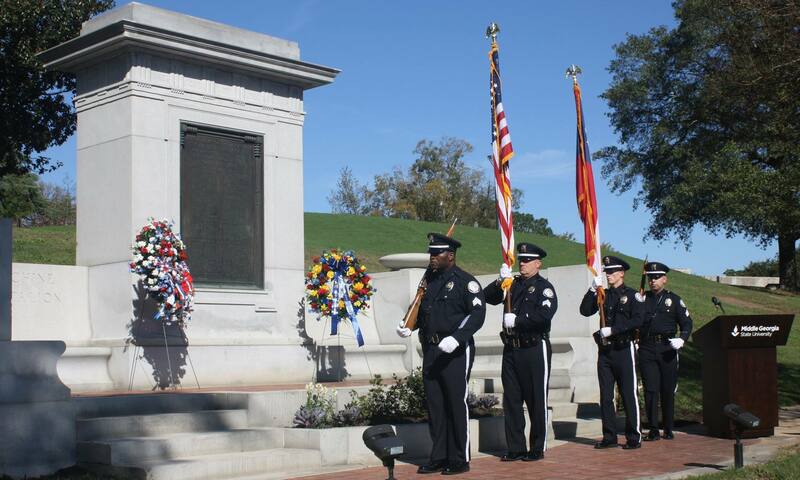 Both events will be held at the World War I Memorial on Coleman Hill in Downtown Macon-Bibb. World War I ended at the 11th hour on the 11th day of the 11th month in 1918, and to mark its end at the time it ended in Europe, the first ceremony will begin at 5:00 a.m. on Sunday, November 11. A welcome will be given by Dr. Christopher Blake, President of Middle Georgia State University, before candles will be lit and a two-minute moment of silence held to remember those lost in the war. The second ceremony will be held in the same location at 11:00 a.m. on Monday, November 12. Churches in Macon-Bibb County are encouraged to ring their bells 21 times in commemoration of the Armistice. A program will begin shortly thereafter that will include: Posting and Retiring by Middle Georgia State University Police, remarks from both Dr. Blake and Mayor Reichert, a reading of “The Fallen” by Robert Laurence Binyon, a Wreath Laying, two-minutes of silence, the Lord’s Prayer, and a musical selection from Dr. N. Alan Clark, Middle Georgia State University Director of Bands.